Landon and I went to the doctor last week and found out that I am still measuring ahead of where I'm supposed to be. Our doctor recommended another ultrasound at our 36 week appointment so that she can see how big Britton has gotten and to re-evaluate her due date if necessary. We're getting SO close to Britton being full-term (18 days!!! until she's 37 weeks, and 40 days until her due date). I'm ready for her to be here, but at the same time, I wish for more time to finish everything on my "before baby comes" checklist. But, I'm not in the driver's seat, so I have to told tight until Britton tells me it's time to boogie! Total weight gain: 26 pounds. 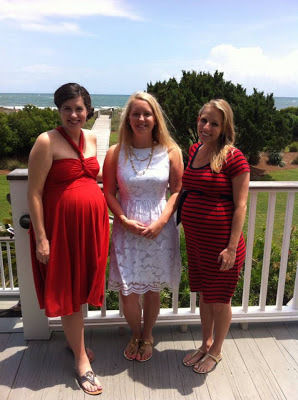 Maternity clothes: I dream of my pre-preggy clothes at this point. I am cheap and refuse to buy anymore maternity clothes this close to the end of my pregnancy, so I feel as if I'm wearing the same things over and over and over again. Sleep: I have definitely been sleep-trained by Britton. If you'd told me a year ago that I could work eight hours after getting up every hour and a half to pee at night (and feel mostly fine during my work day), I would have thought you were crazy. I do miss having long stretches of uninterrupted sleep even if I can function without it. Best moment this week: Finding our pediatrician and having our meet and greet with him. Another thing checked off my to-do list! Miss anything? Being able to sleep on my back. My cute summer-y clothes and shorts. Sub sandwiches. Movement: Alllll the time. Britton has decided that she loves to put her tiny foot up next to my right rib. I'm glad she's comfy, but that sure makes it hard for me to get to sleep. Food cravings: Salads and watermelon are still winning. I've also wanted a scoop of dark chocolate with pecan praline mix-ins in a sprinkle waffle cone from Marble Slab Creamery for a while now, but haven't gotten around to getting one yet. Anything making you queasy or sick? Oh, the heartburn, the bane of my existence. Sometimes my preggo brain makes me forget to take my pill in the morning and I spend the rest of the work day chugging water in an attempt to combat the fire in my esophagus. Labor signs: Braxton-Hicks on and off. Symptoms: Big belly. Slight waddling. Tiredness. Belly button in or out? My innie belly button is very resilient. It is STILL hanging in there (but just barely). Wedding rings on or off? They had to come off early this week. I am very sad, and I feel naked without my jewelry. Happy or moody most of the time: Happy (at the baby and the fact that school is almost over) and annoyed (at the house, which still hasn't been fixed, and the lack of subsequent nesting that I will be able to do before Britton arrives). Looking forward to: Our third ultrasound (I love getting to see our baby!) and learning more about how big she is.